Hungry Bears info about the game-Games2Rule. You just opened the only pancake shop in town. The bears in this town love pancakes! Whip some some batter and fry up some breakfast cakes for these mammoth appetites before they head into hibernation. 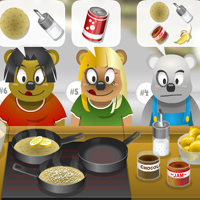 Serve up the pancakes quickly for the highest score! But remember, bears hate burnt pancakes!